I already have two watercolor kits for the field – one is a Sennelier 14-color travel set and one is a 3-color Daniel Smith primary set I made from a repurposed eye shadow container. I’ve enjoyed using the Sennelier colors, but since they came as a set I wasn’t always happy with the color choices (are we ever?). I always planned to use them up and refill them with colors I use most often. The primary set I use for times when I lighten my load and carry just the basics. Part of me always wanted to have access to some of the colors on my larger palette – some have wonderful properties that I wanted to use in the field or just anywhere. So I’ve been browsing for some time through art catalogs and online, searching for an empty palette that I could travel with, wouldn’t cost much, and wouldn’t leak (one of my complaints about my other kits). Wow! One can spend a lot of money on EMPTY palette containers. You may remember from an earlier post that I am at heart a frugal artist. Since I recently had a pleasant experience buying Kimberly watercolor pencils on eBay, I felt comfortable taking a chance there. 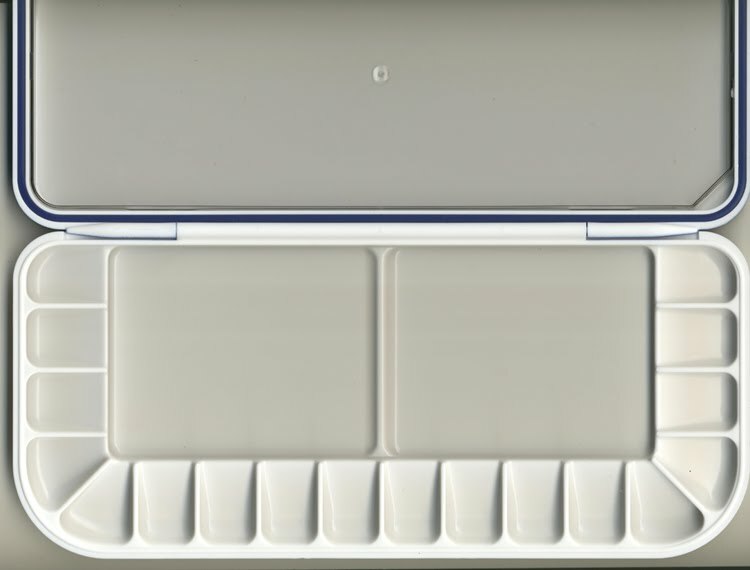 I found this 18-color empty plastic travel palette at a reasonable cost, and with more of a complete description than I found in my catalogs. Shipping costs were minimal, and it arrived in the original box. I filled them with the Daniel Smith paints that I felt I would use most often, trying for a balance between warm and cool versions of hues. I sketched and painted my layout as an aid for the future: not only does it help to see how the colors look on paper, but when it’s time to refill them I’ll select the right color! 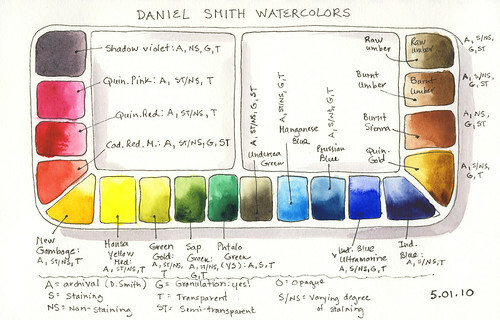 Then I also wrote down some of the properties from my Daniel Smith catalog. Knowing certain properties can really help me as I paint, especially the transparency and staining attributes, since sometimes I like to glaze or lift colors. There were some surprises in store; this exercise taught me a bit more about my materials that I’d either forgotten or had never realized. So far, it’s worked out well! It has a hinged lid with a fold-over latch. The seal is indeed leak-proof, and I appreciate the ample mixing wells. 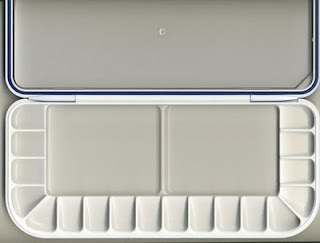 A clear plastic lift-out tray fits into the top lid for mixing colors. The entire closed box measures 5-1/4 wide by 10-5/8 long by 1 inch tall. It’s larger than my other palettes but it works; it’s nearly the same size as my sketchbooks. I made a 2-inch wide elastic large strap with a Velcro closure that I use to bundle my sketchbook, palette, and waterbrush box together, and it works better with that set-up than my other palettes. If you click on the bottom image you can see them larger on my Flickr photostream. Interesting - I recognize this as my palette too. I have several and I love them. I wish you happy sketching with yours. I'm also interested to compare your color selections with what I have in mine. How fun to put together a new palette. I love the sketch with the paints filled in--very useful. I think I'll do that for my travel palette. Right now I just use a slip of paper with the names of the paints on it! Wonderful, Elizabeth! Sounds like you are really specializing. Hi Claire! These are wonderful, aren’t they! So far I just LOVE it. What sort of color selections do you use in your different palettes? My husband suggested that I have one for plants, one for landscapes, one for sea colors, etc. I’d love to see your palettes! If you post back to this page, please leave us a link to visit! Thanks, Kathy. This was really fun to put together and to sketch. I used to write down the names of my paints, but then it became too difficult to remember the visual aspects. Then I tried swatches, which was great, but then I had to correlate the swatches with the location on my palette. Hah! Although this drawing took some time to create, it’s turning out to be a great visual shortcut for me! Hell Cindy, thanks for coming by! I’m almost getting a little too specialized, though!